Narrations in a Powerpoint presentation afford you the ability to create a complete presentation that includes your audio dialogue to accompany the visual aid that is your slides. This lets you craft the perfect, complete presentation that you can either play for an audience, or distribute to others as a single digital file. But occasionally you might need to give a version of the presentation for which the existing narrations are either not appropriate, useful, or correct. Fortunately you have control over whether or not the narrations play in your presentation. 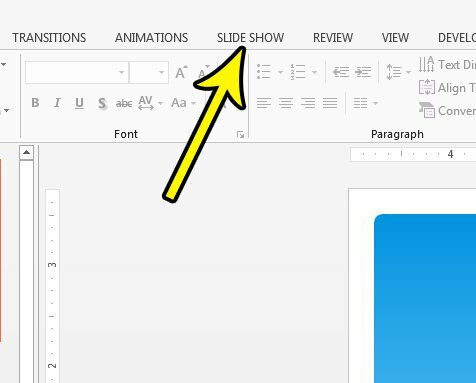 Our guide below will show you how to stop those narrations from playing in your Powerpoint 2013 presentation if you don’t need or want them. 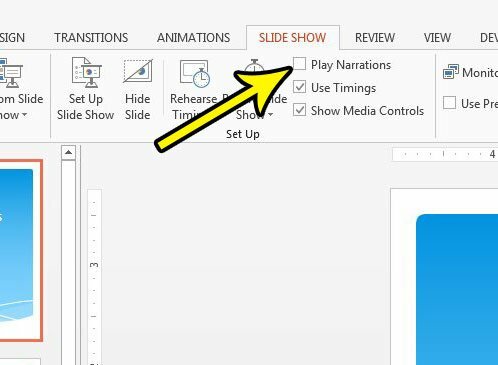 The steps in this guide are going to show you how to stop a presentation’s narrations from playing. Note that this is not going to delete or remove the narrations from the presentation, so you will be able to save them for later. However, it will prevent them from playing until you re-enable this setting. Step 2: Click the Slide Show tab at the top of the window. Step 3: Click the box to the left of Play Narrations to remove the check mark. Once there is no check mark in that box, your presentation’s narrations will not play. I have disabled narrations in the image below. Does your presentation involve a lot of speaker’s notes, and you would like to be able to print them along with your slides as an aid for when you give the presentation? Learn how to print notes along with your Powerpoint presentation so that you have a working copy of the presentation that you can work from.